Hi Emma, This card is so cute! I'm loving the new stamps! I hope you have a super blessed day! Very cute, Emma! You always add just the right touch to any card you create. Where can we get Life's A Party Cartridge? Looks really cute. love that card!! I have 3 nephews and since I have 2 girls and am always in princess/glitter mode I have trouble finding "boyish" inspiration!! Awesome card, love the face. Can't wait to see the new sentiments. See you on Ustream. What a great boy card! Emma, that is so stinkin' cute! I love the new stamp, and I'm quite excited for it, as I've got 3 nephews. That will be perfect! Great card Emma!! Love your new stamp. Very cute! We have the boys too so that will be nice, always looking for guy things. Thanks for sharing! Super cute!!!! Peachy Keen face made all the difference along with your outline and stitching lines. Very cute, he is going to love it. emma! this is so cute! This is the perfect "boy" card!! I love it! To cute, love the do-rag skull and bones. That face really matched perfect. Love it....to cool!! Loving that nephew stamp!! Thanks for sharing Emma. 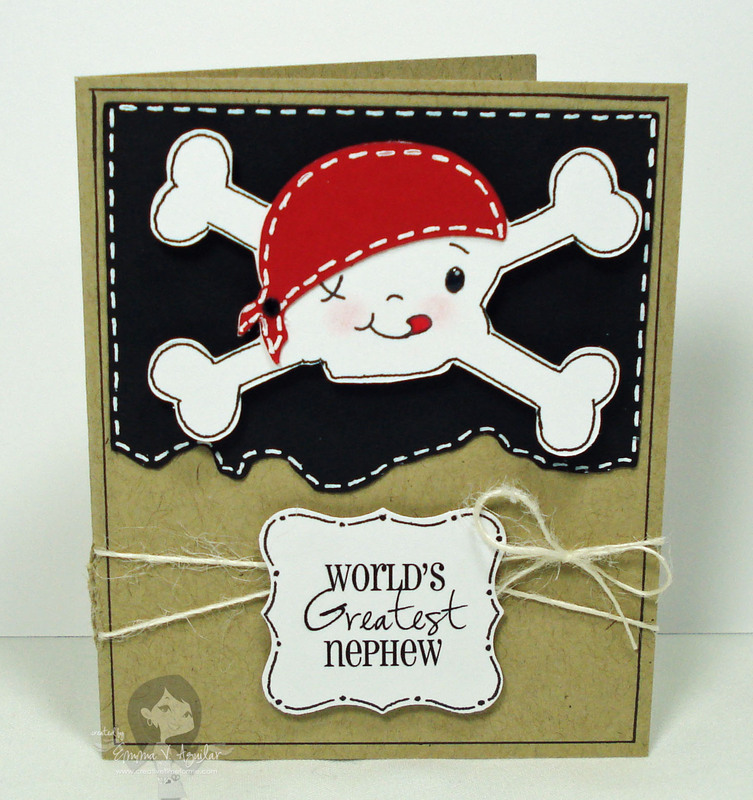 What a great card - and perfect for a little guy! I love the touch of bling on the bandanna. Thank you SOOOOO much for the stamps!! They arrived and I am SOOO excited to use them!! Love it Emma, it's too, too cute!!! Very Cute Emma, I love the faces. As always you make everything look so easy :) Thanks for sharing.